Feeling stressed out about how to celebrate Earth Day? 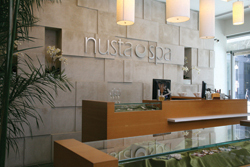 Nusta Spa has a relaxing solution. Between April 18-24, the country’s first LEED certified spa will donate 10% of all proceeds from spa services and retail sales to Rainforest Alliance, an international non-profit organization dedicated to the conservation of tropical forests throughout the world. Founder Elizabeth Snowdon opened the spa in May, 2004 after a trip to the Inca city of Machu Picchu. It was in Peru where she found the inspiration to build a luxury “natural” day spa that would honor the principles of environmental responsibility while still catering to Washington’s downtown clientele. “I was always under the impression that ‘going green’ meant sacrificing the luxuries that we expect at day spas, but after learning more about sustainable building practices, I realized that I could create a warm, healthy environment that still felt luxurious,” says Snowdon. With the help of a DC architect and sustainable building experts, Snowdon realized her vision with an eco-spa that incorporates virtually all environmentally-friendly materials, including Forest Stewardship Council-certified wood flooring, Energy Star appliances, LED efficient lightening, and more. Nusta even carries its own organic skincare line that is free of allergens and unnatural chemicals.